It’s time for Website of the Month! 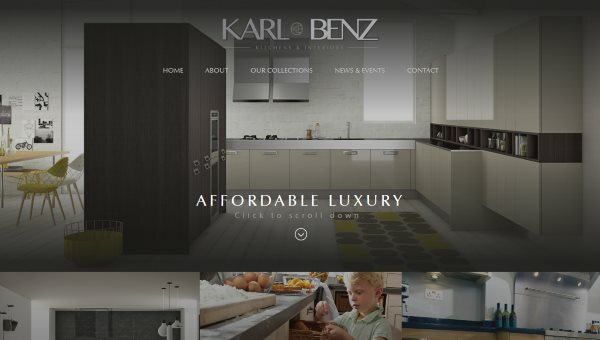 Karl Benz is a stylish furniture and fitting company based in Sheffield, providing classic and elegant fully fitted kitchens, bedrooms, and media centres, and their website is just as stylish and elegant as their furniture. With clean lines, large and attractive photos, and an easy to navigate system, Karl Benz’s website gives you the same soothing calm that you must get when you walk into one of their kitchens. Second place went to Astro-holidays, booking self-catering holidays in the Greek island of Kefalonia, and third place went to Lavinton, an artisanal sheep farm based in Lincolnshire. Thank you to everyone who participated in Website of the Month!